Vertex has announced the European Union approval of its new two-drug combination Symkevi (tezacaftor/ivacaftor), which helps expand treatment to a far larger number of cystic fibrosis (CF) patients. The company has pioneered treatment of CF with Kalydeco (ivacaftor) and combination Orkambi (lumacaftor/ivacaftor), but the latter can only be used in the 45% of patients who have two copies of the F508del mutation. The new combination has been shown to be effective in a far larger group of patients, and the company now says that the vast majority of the world’s CF patients will be eligible for treatment with one or more of their drugs. Symkevi combines ivacaftor with a new agent texacaftor and is licensed to treat people with cystic fibrosis aged 12 and older who either have two copies of the F508del mutation in the cystic fibrosis transmembrane conductance regulator (CFTR) gene, or one copy of the F508del mutation and a copy of one of 14 mutations in which the CFTR protein shows residual activity. The new combination was approved by the FDA and is known as Symdeko in the US and Canada. 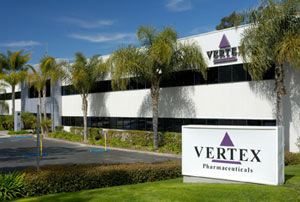 Its approval on both sides of the Atlantic will now boost Vertex’s sales forecasts considerably, with analysts predicting the firm’s revenues will jump to $3.75bn next year, up from a forecast $2.17bn this year. The new combination has shown greater efficacy than Orkambi and with fewer side effects, something which should help it become a commercial success in key markets. Gaining market access in Europe is far from straightforward however, especially in England, home to one of the highest numbers of CF patients anywhere in the world. Vertex has been in an ugly standoff with budget holder NHS England over pricing and reimbursement of Orkambi, with a stalemate meaning most patients in the country still can’t access the drug. The imminent arrival of Symkevi had been factored into the pricing negotiations, but Vertex has rejected an NHS England offer that “provides the potential” for Vertex to secure revenues of £1bn over the next 10 years from Orkambi, Kalydeco and Symkevi without having to gain NICE approval. The last offer from NHS England for an average of all of Vertex’s CF medicines is a nearly 90% discount on what Germany pays for one of Vertex’s medicines.